Age: He's a Time Lord, so birthdays don't count for much. Television age: 30 on November 23. Appearance: Changeable, to say the least. Has taken the earthly form of actors William Hartnell, Patrick Troughton, Peter Cushing, Jon Pertwee, Tom Baker, Peter Davison, Colin Baker and Sylvester McCoy. Occupation: Saving the world. Scaring kids on Saturday evenings. Why is he in the news? First, Steven Spielberg is rumoured to be discussing a new multi-million pound Doctor Who series with BBC1 supremo Alan Yentob. 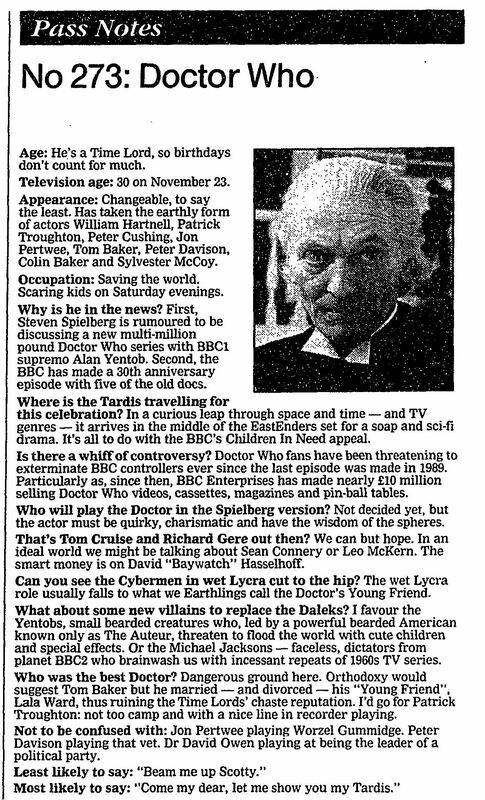 Second, the BBC has made a 30th anniversary episode with five of the old does. Where is the Tardis travelling for this celebration? In a curious leap through space and time — and TV genres — it arrives in the middle of the EastEnders set for a soap and sci-fi drama. It's all to do with the BBC's Children In Need appeal. Is there a whiff of controversy? Doctor Who fans have been threatening to exterminate BBC controllers ever since the last episode was made in 1989. Particularly as, since then, BBC Enterprises has made nearly £10 million selling Doctor Who videos, cassettes, magazines and pin-ball tables. Who will play the Doctor in the Spielberg version? Not decided yet, but the actor must be quirky, charismatic and have the wisdom of the spheres. That's Tom Cruise and Richard Gere out then? We can but hope. In an ideal world we might be talking about Sean Connery or Leo McKern. The smart money is on David "Baywatch" Hasselhoff. Can you see the Cybermen in wet Lycra cut to the hip? The wet Lycra role usually falls to what we Earthlings call the Doctor's Young Friend. What about some new villains to replace the Daleks? I favour the Yentobs, small bearded creatures who, led by a powerful bearded American known only as The Auteur, threaten to flood the world with cute children and special effects. Or the Michael Jackson — faceless, dictators from planet BBC2 who brainwash us with incessant repeats of 1960s TV series. Who was the best Doctor? Dangerous ground here. Orthodoxy would suggest Tom Baker but he married — and divorced — his "Young Friend", Lala Ward, thus ruining the Time Lords' chaste reputation. I'd go for Patrick Troughton: not too camp and with a nice line in recorder playing. Not to be confused with: Jon Pertwee playing Worzel Gummidge. Peter Davison playing that vet. Dr David Owen playing at being the leader of a political party. Least likely to say: "Beam me up Scotty." Most likely to say: "Come my dear, let me show you my Tardis." APA 6th ed. : (1993-10-29). No 273: Doctor Who. The Guardian p. 3. MLA 7th ed. : "No 273: Doctor Who." The Guardian [add city] 1993-10-29, 3. Print. Turabian: "No 273: Doctor Who." The Guardian, 1993-10-29, section, 3 edition. This page was last modified on 23 December 2014, at 23:47.